Advice for savvy executives: bring the phrasebook. Shenzhen business hotels review, luxury stays, shopping, high speed trains, and the biggest golf courses in the world, all in the Wild Wild East. No, not Hong Kong, welcome to Shenzhen, a city that never sleeps, the new Silicon Valley of the East, Shenzhen is a city for nightlife, shopping, food, manufacturing and corporate meetings at atrractive rates. While it is true that twenty years ago Shenzhen could be a very tough place, the city today would be unrecognisable to the thugs of the ’90s. Shenzhen, the Chinese mega-city just over the border from Hong Kong, so close in fact that their two subway systems link up, is regarded with unfounded trepidation by many Hongkongers. These fears increasingly have little to do with the fast changing reality on the ground. There was a trial of endurance in the early days pre-high speed rail. For an hour from Hong Kong's Central to the border via Lok Ma Chau, intrepid visitors would find themselves relentlessly pressed up against elbows-out pedestrians and umbrella-jabbing grannies. The wide tree-lined boulevards and big open public spaces of Shenzhen will come as a huge relief. And surprise. I descended into the city’s clean, comprehensive and efficient subway system, followed the clear English signage to my train and saw a youth get up to give his seat to a woman with a baby. These didn’t seem like “bad” people at all. There is a friendly can-do spirit and bustle that is akin to Hong Kong but uniquely different. While this is not a Shenzhen fun guide, our enquiry focused more sharply on the string of new and older Shenzhen business hotels, we do delve into a few areas to let down your hair. Shenzhen is one of the more pleasant cities in China. It is gleaming, green and clean, energetic but not overwhelming. 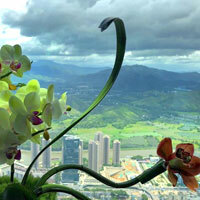 Shenzhen is first and foremost an immigrant city with a massive population of outsiders from all over China. The result of which is that diverse cultures, languages (none of which are English, so bring a dictionary) and especially cuisines all come together in an entertaining hodgepodge. There is art here and music and lots of interesting people doing interesting things. Even if you still don’t want to make a visit, your boss may send you there anyway. In Shenzhen, the IT industry - led by tech giant Tencent - is booming, to say nothing of textiles and manufacturing. The city is also home to China’s second stock exchange. There is a new super high-speed railway connecting Guangzhou and Hong Kong under construction. These new developments in conjunction with an increasingly porous border with Hong Kong to the south mean that the business boom in Shenzhen is only just beginning. If you are a reluctant business traveller, don’t fret. In fact, rejoice, because to accommodate the surge of international businesses, five-star hotels at a world-class standard have been popping up all over the place with occasional leeway on prices. First let’s get you oriented. 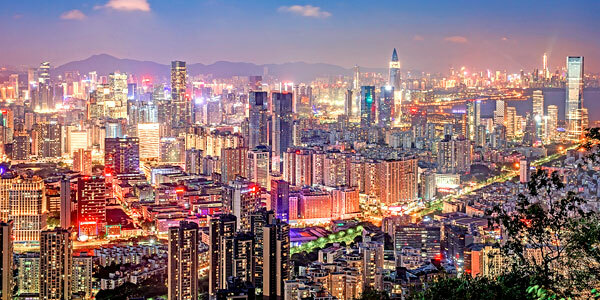 Shenzhen is China’s third largest city with a population of 14 million, and its richest. It is also an incredibly young city both in terms of its facilities and population. 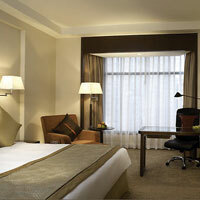 Its relative youth means that most five-star hotels have been built within a decade or so and exude a shiny freshness. It also means that urban planning is miles ahead of other Chinese cities. Shenzhen stretches along a very long but also very narrow band of land on China’s southern coast. Set in the western extremity is Shekou, an expat enclave with nice waterside walks, western restaurants, lots of haute couture doggies and the high end stores that cater to them. A great place to live no doubt and fun for a night out with lots of restaurants and nightlife options, but it probably won’t make it into the average business traveller’s itinerary. This area - Shenzhen Bay - is also the port of entry for the ferry from Hong Kong or the leisurely bus (with many pick-up points in Hong Kong). Heading east from Shekou you’ll hit OCT (literally overseas Chinese town). This central block was originally promoted as Shenzhen’s tourist zone and is full to bursting with the city’s infamous theme parks. Ogle the Eiffel Tower at Windows Of The World, get a dose of nationalism at Splendid China and The China Folk Culture Village or hit the waterslides at Happy Valley. The OCT is in decline as a tourist destination but is still very popular with residents of means due to its expensive housing and pleasant neighbourhood feel. Also, because of its central location right on the edge of downtown, OCT has its fair share of nice hotels like the InterContinental and Westin. Continuing eastwards we arrive in the beating commercial heart of Shenzhen, Futian. This is Shenzhen’s new CBD (central business district) and has grown up fast to mostly eclipse the old downtown, Luohu. Futian’s stature is only going to grow with major construction projects like the new Shenzhen stock exchange, the new terminus for the Hong Kong-Shenzhen-Guangzhou high speed rail line (Futian Port and Lok Ma Chau - on the Hong Kong side - is a newer border crossing already in operation) and the Pingan International Finance Centre, claimed to be the second tallest building in the world. From Hong Kong's West Kowloon Station, Futian is just a 14 minute run at speeds approaching 200kph. All the immigration formalities (Hong Kong and China) are conducted at the West Kowloon Station leaving Shenzhen-bound passengers free to scamper out at Exit 10 (next to the Shangri-La Futian and a short walk from The Ritz and Four Seasons). Most of the newer international brands are located in Futian. Aside from being an important centre for business and commerce Futian is also significant because it is one of the main overland border crossings between Hong Kong and the mainland. Travellers coming in from Hong Kong are well advised to pick the Futian crossing (Lok Ma Chau on the Hong Kong side or the high speed station) over the much more hectic and tedious Luohu (Lowu) crossing. Finally, farther east is Luohu, Shenzhen’s original CBD. All of the prosperity of modern Shenzhen began with the enormous success of Luohu and although its dominance as a business district may have been challenged by Futian, the area is still a vital hub for international commerce. Increasingly, Luohu (also Lowu) is being developed as a Shenzhen shopping Mecca. You can find anything here from luxury brands to bargain basement custom made suits. The tailors tend to be gathered around the train station but for the real brand name shopping head to one of the mega-malls, of which Mix C is the local favourite. Many travellers pass through Luohu because it is home to Shenzhen’s train station and an entry port into Hong Kong. Luohu is the rest of China’s door to Shenzhen. For business travellers, Luohu will probably be the farthest east your trip takes you. But, eastern Shenzhen offers up many pleasant surprises from expanses of wilderness to beaches, seafood restaurants, resorts and vacation areas, and some history. If you have the time it makes for rewarding exploring and is the weekend escape of choice for many Shenzhen residents. However, chances are you're on the prowl, overstuffed golf bag in tow, searching for a big swing out on the greens. You're in luck. Shenzhen is home to some of the most extensive greens and fairways in the world - 20sq km to be precise, a leisurely drive up from the business area. Mission Hills Shenzhen Resort (www.missionhillschina.com/en) is nestled in verdant surrounds offering seven 18-hole golf courses (many of these championship courses) with night and day facilities, an excellent and extensive clubhouse, spa, child-friendly services, versatile corporate meetings and events space, and well-equipped contemporary accommodation going up to 500 rooms in Shenzhen (and neighbouring Dongguan). The Shenzhen golf experience includes the 7,294 yard (par 72) World Cup Course designed by golf legend Jack Nicklaus. The course is accredited by the US PGA and its expansive greens have witnessed fine-arc swings by greats like Greg Norman and Tiger Woods. The Vijay Course designed by Fiji golf maestro Vijay Singh is 6,883 yards, while the Ozaki Course presents a 7,024 yard challenge. Mission Hills serves up a veritable independently contained destination for meeting planners, families with kids in need of distraction, and a CEO venue for spectacular events and resort weddings. One of the characteristics that make Shenzhen a destination with so much potential for travellers is the ease of transportation. The Shenzhen metro system is huge but instead of being overwhelming it is a joy to ride: the ticketing system is intuitive, the trains are unfailingly efficient (one arrives every three minutes) and both the signage and announcements are in English. Best of all the metro is only between Rmb2 and Rmb9 (US$1=Rmb6.72) a trip and reaches just about everywhere. For those who prefer to be driven, Shenzhen is the perfect place to indulge your less than plebeian instincts. Taxis are everywhere, well managed and cheap. Flag-fall starts at Rmb10 and you can pretty much get across all of Shenzhen, no short distance that, for under Rmb60. Cabs are safe and as long as you get in an official taxi you are unlikely to be ripped off. Just make sure you have the address of your destination written down in Chinese. For the most part Shenzhen taxi drivers do not speak English. Places in Shenzhen are farther from each other than they appear on the map. So bring a Chinese-English dictionary. You might find yourself depending on cab drivers more than you anticipated. Shenzhen is also one of the region’s major air hubs. The Shenzhen Bao’an Airport is connected to downtown Shenzhen via metro line number one and is about a Rmb100 ride from central Futian by taxi. Because of their close proximity, many travellers arrive in Shenzhen via Hong Kong or Guangzhou airports. Shenzhen is easily accessible from Guangzhou by train and in the case of Hong Kong by subway, ferry or, if you are Gordon Gekko, helicopter. There’s no reason a business trip to Shenzhen shouldn’t be at least a little fun. The city is full of exciting nightlife, great bargains and delicious meals. For Shenzhen nightlife people tend to gravitate to Shekou and especially the Sea World area where there are lots of great western bars, good dancing thanks to some of the best Filipino bands on earth and the chance to have a beer on a decommissioned Russian ship. Another busy area for nocturnal fun seekers is Coco Park in Futian, with lots of outdoor lounges, bars and dance spots. Spend time in the vast Link City underground shopping, dining, and entertainment zone between The Ritz-Carlton and Four Seasons. 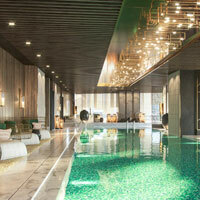 A popular way to spend a day in Shenzhen is to hit a spa. These huge facilities are everywhere and offer all kinds of massage and foot reflexology services at rock bottom prices. Dining is a blast. Food lovers will be right at home in Shenzhen. Aside from the omnipresent Cantonese fare, the city abounds with food streets selling specialties from all over China and even Korea and Japan. Traditional outdoor dining may be dying in Hong Kong but it is alive and well in Shenzhen so pull up a plastic chair and pop open a frosty Kingway. Roadside eateries stay open all night. 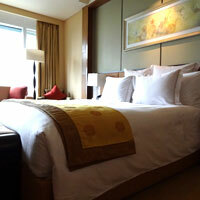 On with our Shenzhen business hotels review. If you’re flying in via the far west Shenzhen Bao’an Airport and need a hotel close by for a quick getaway later, there’s no better choice than the JW Marriott Hotel Shenzhen Bao’an (February 2015). This is a 356-room Muscle MICE affair with elegant touches and more luxury trim than you could wave a stick at. Think serene water features, green bamboo screens, and acres of creamy marble, nowhere more evident than in the soaring and pleasingly uncluttered lobby that rises up cathedral-like to greet a 'phoenix' chandelier fluttering across the ceiling in graceful curves. The phoenix is evident throughout in various design motifs, and its roost - a silver pinnacle that dominates the otherwise quiet entrance - is the first thing you see as you walk in. This corner of Shenzhen, while still developing and dotted with construction sites, is largely green, neat, and well ordered. In fact, arrival through the very civilized Shenzhen Bay border is a pleasant surprise, with few crowds and an orderly taxi queue. It is about a 20-minute drive from there to the hotel. The scale and facilities at this JW will please meeting planners immensely. Consider this – eight meeting rooms with a combined space of 27,986sq ft (of which the Grand Ballroom serves up 2,070sq ft), assorted hi-tech paraphernalia for anything from stylish small corporate meetings to lavish conferences, trade shows, banquets or weddings, and the can-do attitude of a livewire general manager brimming with sparky ideas. Also expect a huge pre-function area with panoramic bay views welcoming of light. Mark it down as a top Shenzhen conference hotels choice. No restaurants and shops in the vicinity, but the hotel offers several distractions for the apres-work crowd. A 43sq m Deluxe will appeal to both business and leisure travellers with its elegant finish – with homey comfort in mind. Think floor-to-ceiling windows, thoughtful soundproofing, pastel tones with cobalt blue carpeting, overstuffed virginal white king-size bed (or two doubles), a settee with eye-grabbing turquoise cushions, contemporary Chinese-lantern lamps, complimentary wired broadband and WiFi, 32-inch LCD television (with CNN and satellite stations), a work desk, laptop-friendly safe, and an iron and ironing board for stubborn wrinkles. A monochrome Chinese brushstroke painting featuring the aforementioned phoenix, completes the setting, with Aromatherapy Associates bath amenities to encourage lingering stays in the toilet. The mirrors are large and well-lit so don't be coy with the make-up or shaving cream. There is one three-pin multi-plug socket at either side of the bed. A 95sq m Deluxe Bay View Suite serves up a similar mix of cream marble flooring with blue carpets in the living area and bedroom. There are two flat-screen TVs here and a egg-shaped 'pod' Japanese toilet springs awake to pamper your derriere as soon as you wander in. Other rooms feature bog-standard but smart toilets without the aerobic spin. In the bath expect the de rigueur rain shower, a soaking tub, weighing scales, and hairdryer. There are ample three-pin multi-plug sockets as well as the Chinese crow's feet plug points. Our pick is the corner Premier with its curved glass window that runs the entire length of the room right up to a startlingly exposed bathtub. Draw the blinds if you must. A good idea as the neighbouring apartments look in from across the rock pool. Executive rooms offer lounge access and a Presidential Suite ups the ante at 189sq m of rumpus room in a more ornate – yet subdued – Chinese palace setting. For the health inclined there’s a 40m heated indoor pool as well as an outdoor splash area and a fitness centre (arriving April 2015). A spa is in the pipeline. Meanwhile three F&B outlets cater for that must-have calorie intake. Shenzhen Kitchen does all-day dining with flavours from around the world (and a nice alfresco section) while the top-floor Bayview Restaurant offers Chinese and Western in luxe surrounds. Take a close look at the new Raffles Shenzhen (March 2019) at One Shenzhen Bay, which brings the group's usual understated yet classic feel in a contemporary setting with grand views and oodles of space. Expect parquet wood floors matched with textured grey marble, a green-tile indoor pool, and 60sq m Deluxe rooms with pale wood walls, black-and-white reflections art, cream sofas, easy chairs and plenty of natural light. The Raffles Suite runs up to 159sq m, spacious marble bathrooms and black filigree separators while the Raffles Spa for apres-work rubdowns stretches to 1,500sq m.
With the exception of ceramic bulls everywhere, some tapas on the room service menu and the aforementioned outfits, the Spanish theme doesn’t seem to have much effect on the overall experience. The InterContinental is one of the largest hotels in the area with 540 rooms. But its size does not detract from the personal and friendly service. The rooms themselves are very large with a large sitting area, big beds, flat screen TVs, and large work spaces. There is a Bose sound system and free DVD rental. The most striking part of the room is the bathroom with a large walk-in shower and standalone circular soaking tub with a large window opening onto the bedroom. WiFi is free throughout the hotel. There is a laptop safe in the room too. Close to the InterContinental is the Westin Shenzhen Nanshan. On the map it looks like it is right across the street but in fact it is on the other side of the ‘Windows on the World’ theme park (about a 15 minute walk). The Westin is housed in a modern building in Holiday Plaza and attached to the mall. It caters mostly to corporate travellers but also offers weekend family fun packages because of its proximity to the theme parks. Rooms are clean, comfortable and modern. Bathrooms feature walk-in showers and cool looking standalone tubs. The sink area boasts a shaving mirror and great lighting all around. Rooms offer safes and ironing boards. Ask for a room overlooking Windows Of The World. Haven’t you always wanted to sleep with a view over the Eiffel tower? WiFi is charged at Rmb90 a day. Across the street from the Westin is the Raytour - The Venice Hotel Shenzhen. This Venice themed pink hotel used to be the equally Venice-themed Crowne Plaza but changed hands at the beginning of 2012. It came under Raytour by 2018. Expect mechanised gondoliers at the entryway and lots of traditional Venetian garb. The lobby is a surprisingly effective synthesis of Venice with blue skies above, twinkling stars, cobblestones below and murals to either side. The rooms are basic but bright with yellow tones, dark wood accents and open views. The marble bathrooms are grand. Keep an eye out for charming little Venetian surprises like lion claw table legs. This hotel is especially popular with the IT industry. The location is excellent for sightseeing with the family and kids in a greener area of Shenzhen close to top attractions. Yet this whimsical address also caters for corporate meetings - and weddings - with flexible function space including a pillarless ballroom. Let's not forget, this hotel has a long business traveller pedigree. Farther out from the town centre, by the Chinese gardens, is a more affordable option, the The Bauhinia Hotel Shenzhen (formerly a Novotel). This is your basic business hotel, with not a lot of frills but efficient service and good facilities. The influence of the increasingly Chinese clientele is apparent in a general lack of spoken English and a marble clad lobby offering what, to untrained ears, appears to be Chinese circus music piped in 24/7. The hotel has a middle-of-nowhere feel, which is misleading as it is in fact just a quick walk from the subway. 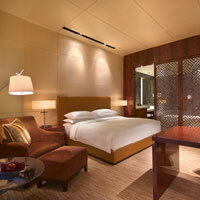 Guests are well advised to spring for a Deluxe room as the small price difference pays big dividends. Whereas the Standard room is very small with no bathtub and a tiny shower, the Deluxe is much larger and boasts a large bathtub and spacious shower with a nice seating area set in the window and even a balcony. Bathrooms offer big mirrors and good lighting. There is a nice outdoor pool and complementary WiFi is offered in most rooms (where WiFi is unavailable a cord for plug-in internet access can be provided). Futian is really where the action is. If Shenzhen has a downtown, this is it and most likely where business travellers will be staying. Luckily for them, this is also where most of the best hotels are located. The Shangri-La Futian is one of two Shangri-La properties in Shenzhen. Its central location puts it right in the heart of the action. The Shangri-la is an oasis of tranquillity in the midst of the chaos outside thanks to a wide, open lobby and soothing water elements. The hotel is fairly new, having arrived in 2008, and still gleams. The service is professional and attentive with lots of smiles all around. At 601 rooms the Shangri-La Futian is one of the largest hotels of its kind in Shenzhen but doesn’t feel impersonal. Rooms are homey with plenty of marble, wood floors and mini chandeliers. Standard rooms boast sitting areas, ample work spaces and little dressing areas with mirrors and stools perfect for applying makeup. Bathrooms are done up in marble and painted wood trim. Expect a small walk-in rain shower and separate tub. The lighting is good and hairdryer well placed. The room is well suited to business travellers with a large work area, lots of outlets, intuitive light switches and free WiFi throughout. The Shangri-la also has among the largest ballrooms and function rooms. This is a strong and well positioned MICE contender that ranks high compared with vs other Shenzhen corporate meetings addresses. Mark it down on your Shenzhen conference hotels short list. 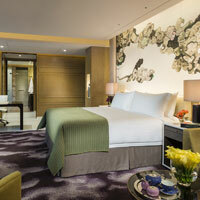 Another popular Futian business hotel is the Sheraton Shenzhen Futian Hotel. This medium size 354-room Sheraton is also in the heart of the business district. The lobby may be a little overwhelming for some. The abundant honey coloured marble and massive chandeliers seem more Winter Palace than Sheraton but the service is prompt and professional. The rooms are modern with lots of dark wood accents and feature an expansive work desk and large sitting area by the window. Outlets are in abundance and well placed throughout and bedside tables are topped by refreshingly simple Sony alarm clocks. All rooms offer ironing boards, tea and coffee facilities and laptop-friendly safes. The bathroom is filled to the brim with beige marble and a bit old fashioned. The bathtub is inviting and the oversized shower can accommodate three easily. The room itself is well lit. WiFi is charged at Rmb100 a day. There is also an impressive outdoor pool area with a grill and live music on the weekends but it is not open in the winter months. Hilton runs a trio with Hilton Shenzhen Shekou Nanhai and a Hilton Garden Inn Shenzhen Bao'an complementing the main business muscle, the 320-room Hilton Shenzhen Futian close by the City Hall and the Stock Exchange. In Futian enjoy 42sq m rooms with full length windows welcoming of light, WiFi, wireless printing and a comfy ergonomic chair for the desk bound. Executive Rooms with a similar get-up offer free access to the Executive Lounge with flowing nibbles and drinks at various hours. If not working out in the outdoor pool or fitness centre, meeting planners will be chuffed to find a 600sq m Grand Ballroom and a range of function rooms encompassing a total 2,400sq m of event space. ALl this, right in the CBD. 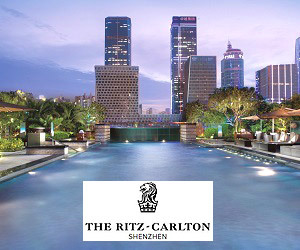 Across the park from the Sheraton and close to the subway is The Ritz Carlton Shenzhen. One of the finest hotels in the city, The Ritz eschews the glitz and grand scale so popular in China in favour of a more refined old world marble-and-wood charm and a focus on personal service. The service is exceptional and helps this Ritz-Carlton stand out from the crowd. 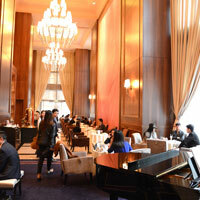 The lobby is small by China standards but well appointed, welcoming, and comfortable. Of an evening, find a jazz band playing and antipasto and wine on offer. Staff is brisk and attentive and you may go hoarse greeting everyone each time you walk through the lobby. The hotel is right on the major thoroughfare but noise does not seem to be a problem. And taxis are plentiful at any time, day or night. The breakfast, which winds up at 10.30am, is superb and an attendant will be happy to pack up a box to go plus coffee for those early morning meetings. The wooden-floor rooms are spacious with large working desks, comfy beds (with easy to use reading lights and electrical sockets in the local Chinese three-pin fashion as well as the Western three-pin standard), sitting areas and widescreen TVs. The desk features two three-pin multi-plug sockets. Décor is rich and traditional yet contemporary, with silk cushions and a gold bed runner draped across a large welcoming mattress. The bathroom is the high point of each room with large soaking tubs looking out through picture windows over the city (or peruse the small TV screen if you wish to be indulgent). Expect great lighting, twin vanities, walk-in rain showers and top-of-the-line bath products like Asprey. There is an in-room laptop-size safe and WiFi is free in the room and throughout the hotel. Dining is a highlight here. Pick from Chinese, Asian and Italian. The Ritz-Carlton rates high as one of the best Shenzhen business hotels on our review and stacks up well vs other competitor brands. The hotel is right next to the Central mall (accessible through the subway) with lots of great stores and dining options. If you like some fire with your dinner, head to Chilli Party. From The Ritz, the underground Link City - an excellent spot with bars, restaurants and posh shops - leads to Four Seasons Hotel. The Four Seasons Hotel Shenzhen (September 2013) is a short drive from the Hong Kong border at Futian Port - by far one of the more and organised civilised entry points. This understated hotel is close to the Convention and Exhibition Center and serves up up the brand's customary spread of delicious rooms, 266 this time, with sink-in feather duvets, flat-screen TV, DVD player, LCD screen in the bathroom mirror, iPod dock, and a pillow menu. The palette is earth tones with woody accents while a purple-grey carpet calls attention to the inviting creaseless white bed with its exuberantly floral head-wall. Guests can also request an in-room humidifier, hypoallergenic bedding, and a laptop, so suits can hit their stride in no time at all sans excuses. A Premier offers comfy gold chairs and ottomans, BOSE speakers, Nespresso, flat-screen televisions, iPod dock, one three-pin international plug socket on either side of the bed, as well as HDMI and USB sockets by the work desk dataport with a further four three-pin multiplug sockets. Bathrooms are slathered in beige marble with a soaking tub and rain shower with a separate dressing area and LCD screen in the mirror. Deluxe Suites running from 93sq m to 103sq m will sleep three (with a rollaway bed) and the de rigueur luxury of marble baths, soaking tubs and rain showers. There are 33 suites in all with two additional top-end retreats. Expect plenty of colour and texture at this contemporary address with bright splashes of art married with bold sculptural statements. There is an indoor as well as outdoor pool, a fitness centre, a spa for apres-work de-stressing and, for the conference-bound, 1,788sq m of function space on the third floor (including a 600sq m ballroom) for small corporate meetings or bigger splashy events. The unobtrusive sixth-floor lobby is in rust marble facing full length windows that lead to an alfresco black stone water park sprinkled with greenery. 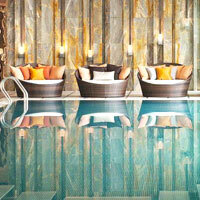 Indoor and outdoor swimming pools are on the eighth floor. Take your pick. 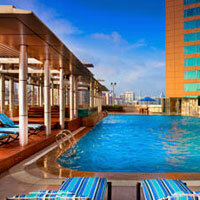 The 402-room JW Marriott Hotel Shenzhen serves up panoramic views that can be enjoyed best from its alfresco pool. Walk into a glittering marble pillared lobby and whoosh up to your room. An Executive Suite with one bedroom is set out in dark wood tones with grey marble underfoot. It is a corporate space with clean straight lines and a tan carpet in the bedroom with a purple bed runner offering modest counterpoint. Also expect a Quan Spa, a fitness club, five dining outlets, and 13,197sq ft of event and meeting space in eight function areas. The Langham Shenzhen adds a touch of elegance to the neighbourhood in a ‘classic’ modern building. Walk into an intimate lobby set around a white marble pillar that takes you past a small 'grand' staircase and a bronze musical trio set in a water feature while piped classical music sets the mood. A pink London cab parked outside lets you know in no uncertain terms where this hotel's DNA comes from. The effect is pleasing, and feminine, yet comfortably corporate. The small lobby adds a Euro feel to things and will calm many who have been 'processed' in China's other grand lobbies where gold and marble is thrust down your throat by the tonne. The lobby leads through ornate doors to a spectacular - and hushed - Palm Court, with soaring salmon wall art, and wood panels. The height of this long room with its elegant and high-set chandeliers creates a visual space that is calming and inviting. It is reminiscent of a European tea salon and the tall pulled-back drapes add to the effect as someone tinkles the ivories on the grand piano. The hotel offers spacious and simple yet classy European-style rooms featuring soft ochre carpets, white walls, plump beds showcased by walnut-wood headrests (and pipe reading lamps), 46-inch flat-screen televisions atop mahogany cabinets, MP3 player, French press coffee and iron and ironing board for sharp creases. Suites starting at 77sq m up the ante with plusher interiors with padded pinched button velvet headboards and seating. These enjoy Langham Club privileges. There are 352 rooms in all at this smart business retreat along with an excellent Chuan Spa, and a 600sq m Grand Ballroom for corporate meetings, MICE events or weddings. A rooftop garden offers addition space for a social get-together or a stylish cocktail bash. The Langham Shenzhen is a quality offering from a quality hotel group and is firmly among the top Shenzhen business hotels candidates. 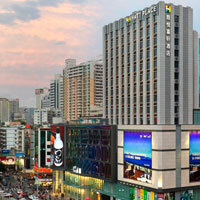 For quick-stop visitors transiting Futian, the Sheraton Four Points Hotel is certainly worth a good look. The hotel is well away from central Futian but right next to the border (with Hong Kong) with complimentary shuttles making the 10-minute trip every half hour. The Four Points itself may lack the glamour of the big name joints up the road but it manages to be a very effective and inviting business hotel at a much more manageable price than its sleeker neighbours. The hotel staff is one of the nicest in the enclave and the property is clean, welcoming and brisk. The rooms are served straight up but appeal with neat beds and a friendly vibe. Hairdryers are provided and light switches, oftentimes so fiddly, are well placed. WiFi is available in all rooms and is charged at Rmb20 for the first hour and Rmb10 for every subsequent hour, maxing out at Rmb90 for a day’s use. There is an outdoor pool but it is closed in the winter. The lobby lounge offers thoughtful daily specials: buy two bottles of beer and score a free chicken quesadilla for example. A good choice for a workmanlike stay. If Futian is considered the new CBD, that does not necessarily mean Luohu is a has-been. This district is booming and its location as an entry point to Hong Kong and the rest of China, keps things humming. As business moves to Futian, Luohu is being developed as a shopping destination and the investment is paying off. The most impressive hotel in Luohu is undoubtedly The St Regis Shenzhen. It is among the world’s tallest St Regis hotels and, in keeping with the trend of super-tall hotels these days, whisks guests from the ground floor up to the “sky lobby” on the 96th floor for check-in. An understated street-level arrival past an office tower and through Starbucks may confuse some. But once you have carefully navigated your way upstairs to the heart of this hi-tech eyrie, the lobby is certainly impressive. The St Regis towers over Shenzhen and the lobby offers binoculars set up around the windows for a mischievous zoom-in on any action of your choosing. The decor is lavish and unrestrained. Narrow strips of brightly coloured stone gleam, chairs are upholstered in purple velvet, and a sparkling crystal-slathered installation greets guests as they step out of the elevator. Look up and take note of the massive almond shaped pod hovering above you. That houses the cigar bar of course. Whatever you do, make time for the Elba Italian Restaurant with its lip-smacking risottos, burrata cheese preparations, and some of the best tiramisu in the East. Not an overstatement by any means. Also make time for the MALT Oyster and Sushi Bar. Vertiginous views all around add to the zest. Other than that St Regis trademark opulence the property distinguishes itself in its use of technology. Every room is completely managed (room service, lights, music, temperature, and TV) through an iPad. With a press of the button next to the bathtub, the lights dim, the curtains close and mood music pours in turning your bathroom into a personal spa. Plug in your iPod and access it via control panels in the bathroom and next to the bed. Check your flights on a flat-screen 3D television. The rooms are comfortable and stylish with all amenities you might possibly think of. The property also boasts a sleek indoor infinity pool. And you can disappear for hours, if not days into the 700sq m Iridium Spa. Try a facial, a signature massage, or plunge into a fullblown 'Romance Package' with facial, aromatherpay massage and skin polish. Dress up for the St Regis. Flip-flops, shorts and singlets are not de rigueur here. This is a top Shenzhen conference hotels pick especially if your tastes run to smaller customised CEO meetings and it effortlessly doubles as well as a luxury retreat. Down the street from the St Regis, and right next to the popular Mix C shopping mall is the Grand Hyatt Shenzhen. Like the St Regis, the Grand Hyatt’s lobby is actually on the 33rd floor which left me wandering around a marble lined luxury shopping mall - think TOD's and BVLGARI - for several minutes before locating the appropriate lift. I am sure the Hyatt has staff down there to direct stragglers. That minor niggle aside, the Grand Hyatt’s lobby is possibly the most impressive in Shenzhen: big beautiful windows with lots of light, simple understated decor, a few tasteful pieces of modern art and lots of tan wood and cream tones. The overall impression is one of lightness in both tone and weight. The staff is prompt and well meaning. The rooms are unique. Open the door to be confronted by a standalone bathtub, to the left of which is a closeted toilet and shower. A walk around the tub brings you to the bed next to a large picture window overlooking the city below. The bathroom area can be separated from the sleeping area by a sliding partition of traditional Chinese woodwork and glass. The glass is in fact “magic glass” that becomes opaque when the door is closed. If these sound like complaints about the layout, they are not. After a moment to get used to the unorthodox style, guests will come to really appreciate it. There is something fun about the room and it is nice to see Hyatt having the courage to try something so entirely new. The 46sq m room feels high end if a little showy. Expect lots of marble, lacquer and highly polished wood veneer that makes the room literally shine. Rooms include laptop-size safes and there is free Wi-Fi throughout the hotel. Guests choose between a city view overlooking Shenzhen and a “mountain view” overlooking the greenery of the New Territories in Hong Kong. This is a good pick among Shenzhen business hotels on our review and offers a range of options for small corporate meetings. MICE is one of the great strengths at this pure-bred executive travel hotel. Also take a moment to pop by the excellent 1881 restaurant on the ground floor (to the left as you enter the complex) for palate tickling Northern Chinese and Szechuan fare that should not unduly exercise the wallet..
For most travellers the major draw to Luohu is the train station, which serves both the mainland and Hong Kong. This makes Luohu the major transit hub in Shenzhen and also explains why the area can seem a little dodgy (think pickpockets not stabbings). Aside from the business hotels in Luohu there are also hotels around the train station that cater more for travellers on the move. 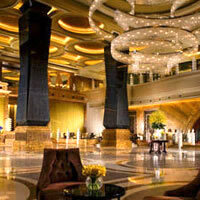 Of these, the most respected is the Shangri-La Hotel Shenzhen. 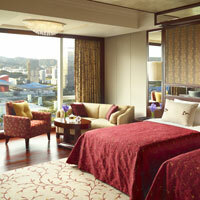 The Luohu Shangri-La is the older of the two properties and one of the first luxury hotels in the city. Its vintage does show and the accommodation does not compare to its glitzier sister in Futian but it is a good quality hotel with delightful staff and business travel amenities. The hotel is well located for people on the move. It is linked to the subway, train station and Hong Kong border via an underground walkway. The rooms themselves are basic but inviting. Expect flatscreen TVs, a nice well-lit workspace, basic alarm clocks and lots of convenient electrical sockets (three-pin square). The bathrooms flaunt separate showers and roomy bathtubs. Bathroom lighting is bright and this complements the usefully large mirror. The hotel is in an enviable position as its service standards significantly exceed those of its nearby competitors, but its price point is much lower than other hotels in the same service bracket. Worth considering. Travellers looking for a more affordable option in the Luohu area should pay the Best Western Shenzhen Felicity Hotel a visit. The hotel is large and efficient but no frills and obviously caters to a mostly local Chinese customer base. Although the Best Western may not necessarily exude personality, it is clean, comfortable and well managed. The location, seemingly right behind the train station, is a tad hair-pulling. It is convenient for the train, of course. But to get anywhere in the area you have to walk right around the station. Not that you would ever really need to leave: there is an outdoor pool, art gallery, a dance studio, a chess parlour, lots of restaurants and two spas on site. The rooms are basic but comfy and clean and, truth be told, not all that different from those at the Shangri-La across the street. A worthwhile Shenzhen budget hotel option to be sure for those hunting for value rather than pampering. 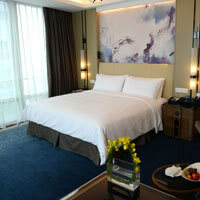 That about wraps up our Shenzhen business hotels review. As you can see, these days surviving Shenzhen is about as easy as remembering to bring along a Chinese phrasebook. Oh, and a big pinch of salt with which to take your Hong Kong friends’ advice. Making waves in Shenzhen is the new-to-Asia brand from Hyatt for comfortable, value, mid-end stays, Hyatt Place Shenzhen Dongmen (May 2014). Situated in the Dongmen Shopping Centre in Luoho District (Lowu). This is an older area that has undergone gradual redevelopment. 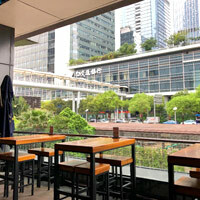 The hotel is close to two railway lines offering access to both the airport as well as the Futian Business District. The home-away-from-home concept employs comfy curl-in sofas, soft carpets and relaxed lighting. The 144 rooms come with deluxe Hyatt bedding, 42-inch flat-screen televisions, extra large work desks and complimentary WiFi. The Gallery restaurant on the sixth floor serves Cantonese and HK-style dishes. This floor also hosts two modest function areas, the largest at 75sq m for up to 40 guests. This is useful space for an easy-access small corporate meeting on the go. 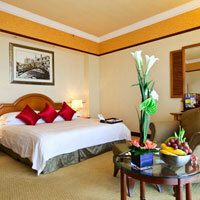 Consider this hotel if looking for a neat and comfortable value downtown address in Shenzhen for business or leisure. Expect easy access to shopping, restaurants and transport. The exchange rate is about US$1=Rmb6.72. Since the Chinese government strictly controls the exchange rate you should get the same rate at every place in Shenzen from hotels to banks. Prices listed here are a rough online guide to the Best Available Rates (BAR) for comparison purposes. Most are online rates. Rates from travel agents or from hotel websites will vary. Prices also change depending on the season and room occupancy. We like the Shenzhen Unique Guide map from Hong Kong but it is more a quirky tourist companion that a serious topographical tool. Metro maps are available at every hotel. Or just download the app. Best Western Shenzhen Felicity Hotel. Tel: [86-755] 2558-6333, (bestwestern.com). 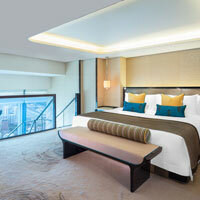 Four Points by Sheraton Shenzhen. Tel: [86-755] 8359-9999, (www.marriott.com/four-points-shenzhen). Four Seasons Hotel Shenzhen. Tel: [86-755] 8826-8888, (www.fourseasons.com/shenzhen/). Futian Shangri-La Shenzhen. Tel: [86-755] 8828-4088, (www.shangri-la.com/futian). Grand Hyatt Shenzhen. 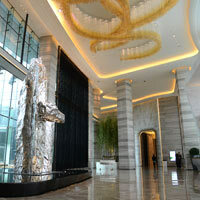 Tel: [86-755] 8266-1234, fax: 8269-1234, (www.hyatt.com/grand-hyatt-shenzhen). Hyatt Place Shenzhen Dongmen. Tel: [86-755] 6188-1234, (www.hyatt.com/hyatt-place-shenzhen). InterContinental Shenzhen. Tel: [86-755] 3399-3388, (www.ihg.com). JW Marriott Hotel Shenzhen. Tel: [86-755] 2269-8888, (www.marriott.com). JW Marriott Hotel Shenzhen Bao’an. Tel: [86-755] 2323-8888, (www.marriott.com/baoan). Mission Hills Shenzhen Resort. Tel: [86-755] 2802-0888, (www.missionhillschina.com/). Raffles Shenzhen. Tel: [86-755] 8666-8666, (www.raffles.com/shenzhen/). Raytour - The Venice Hotel Shenzhen (formerly Crowne Plaza). Tel: [86-755] 2693-6888, (www.szvenicehotel.com). Shangri-La Hotel Shenzhen (Luohu). Tel: [86-755] 8233-0888, (www.shangri-la.com/luohu). Sheraton Shenzhen Futian Hotel. Tel: [86-755] 8383-8888, (www.marriott.com/sheraton-shenzhen-futian). The Bauhinia Hotel Shenzhen. Tel: [86-755] 8282-9966, (www.thebauhinia.com). The Langham Shenzhen. Tel: [86-755] 8828-9888, (shenzhen.langhamhotels.com). The St Regis Shenzhen. Tel: [86-755] 8308-8888, (www.marriott.com/st-regis-shenzhen). The Ritz Carlton Shenzhen. Tel: [86-755] 2222-2222, (www.ritzcarlton.com/shenzhen). The Westin Shenzhen Nanshan. Tel: [86-755] 2698-8888, (www.marriott.com/westin-shenzhen-nanshan).